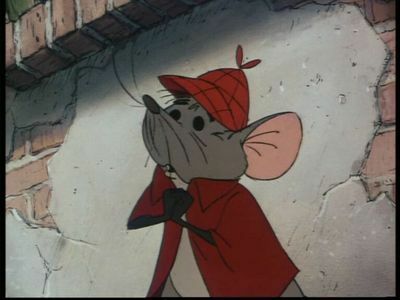 Is there anything cuter than an animated mouse? 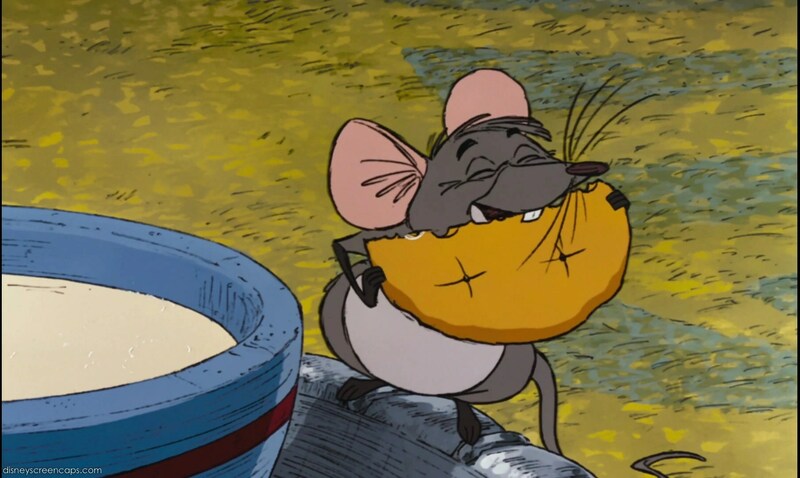 What’s cuter than a little mouse with oversize ears who loves to read? Isn’t your heart just bursting with the cuteness? Are you pouting and saying, “Awwww, wittle mousie” like me? So I’ve been conditioned to like animated mice. They’re adorable. I thought up until today that I wouldn’t like mice in real life, but it turns out, I feel almost the same about them in real life… as long as they’re not darting across the floor of our family room while we’re trying to watch She’s Having A Baby (Kevin Bacon and Elizabeth McGovern, anyone?). Not as cute. No requests for cheese or cracker eating or sweet songs about finding your loved ones. Let the record show that I have few, if any, happy feelings about rats. I was sitting on the upper deck this afternoon, enjoying a cookie in the nice weather, when I looked down at the lower deck and thought to myself, Hey, self, is that the mouse that we saw last night? Might’ve been. Either way, it was a tiny little mouse with little pink hands. And it just sat there, not minding that I came over and talked to it. Mousie, if you know what’s good for you, stay outside. I’ll come admire your cute little whiskery nose and your pink paws and tell you how tiny you are. Then you can not come in my house and not find the traps that are set for you. It’s just not hygienic for us to co-exist in the same place, you know? You don’t want my diseases; I don’t want yours. So, stay outside, lil mousie, okay? And stay cute. At least you’re on my good side. Thank you, Daddy, for your marvelous photography. Today I needed chocolate surrounded by a cookie. Yes, “need” is relative, but because I know the joys and comforts of a warm chocolate chip cookie made with our family’s secret (soon to be not-so-secret) twist on the Toll House recipe, I needed the cookie. Every time I make this cookie recipe, which I now know by heart, I think of being just taller than the countertop, over which I now tower. The sweet, floury smell of the dough brings me right back to my childhood, right back to baking with my mom. Oh, that time when I started the mixer while she was on the phone… without having it in the dough. It sprayed all over the kitchen. Yes, that was part of the beginning of my baking career. Real butter, extra vanilla. The mantra still goes through my head each time I add these. Real butter. Extra vanilla. Mmmmm. To this day, I don’t know what the recipe would be like with margarine or no vanilla. We’ve learned that a quarter cup extra of flour helps, too. I’m just unwilling to try the recipe as its written because the way we make these cookies…. oh, you really can’t eat just one. We used the hand mixer because our Kitchenaid stand mixer was an unthought of luxury in the far-off future at that point. So after mixing up everything but the chocolate chips, my mom would get as much of the dough off the beaters as she could with the rubber scraper, then hand them to me to lick (salmonella, schpalmonella). Something about cookie dough pre-chemical reaction is so tasty. Or maybe I’m just conditioned to like it. Either way, that slightly salty, sweet dough is so good. I have to remind myself to wait for the real cookies. These are some of the things that I want to pass on to another child. Maybe mine, maybe Brooke’s. Maybe someone else’s. I want to share the love of putting ingredients in a bowl and mixing them up and creating something that none of them could become on their own. As often as I try to be open about my struggle (and I use that word because it is a struggle, every single day) with depression and anxiety, I have to say that it’s so hard to come out with it. There’s never really a point where you’re ready to tell the world that your emotional life is messy, that you don’t have control over it sometimes, and that you have woken up every morning for weeks in a row and just cried because there was another day to live through. That’s not something that ever gets easy to say. And if it does get easy to say, that’s because you’re forgetting how hard it was. Because I know that I’m far from alone in this, though, I want to speak up. I want people who don’t have depression to have an idea of what it’s like and to know that if you’ve never experienced it, you will not understand, ever. And I want people who do have depression and have experienced it to know that there is no good reason to feel ashamed (I say “no good reason” because obviously, there are plenty of reasons that we feel ashamed. They are real, but depression is not shameful). You are not alone. In the road to healing, I’ve read a lot of articles written by people with depression, and I’ve noticed this divide between Christians and non-Christians who write. I feel torn sometimes, because sometimes I just want to write like Hyperbole and a Half. She’s so honest, and I can relate to all of the things she says. She’s so blunt, too. Sometimes, I want to say that I feel like ______ (insert word there that Christians don’t use), too because depression feels like an emotional curse word. Then I read things like “Anxiety and depression can also, ironically, be a conduit of hope—an opportunity for the foolishness of God to be displayed in our lives.” from The Gospel Coalition and see that God has a place in all of this. He’s not just a part of my pain; he’s CENTRAL to it. He’s the one who never departs and makes meaning out of it. I love that phrase, the “foolishness of God.” Because it really is pretty foolish to shower grace and mercy and love and blessings on some person who is going to fail you and disappoint you at least half the time and only listen to you when they feel like it and not obey because they think they know better (stupid people). How foolish my God is, to love me. How foolish He has been during the past year. How foolish He is to see my depression and try to tell me that something meaningful will come out of so much pain and so much deadness. God is silly. I guess we did that, too. We are doing that. He is the reason that it’s worth it to tell my story and be open about my struggle. He gives meaning to the mess and passion where there was only pain. Someday, my room will stop smelling like carpet glue, but until then, I’ll just grin and bear it because the carpet that was replaced was the carpet that was in our house when my parents moved in before I was born. Yes, it was kind of old. And the new stuff is plush and squishy. It makes me want to keep my floor clean so I can spend more time sitting on the floor. So, I’ve been going through desks and drawers and boxes this week, discovering all sorts of treasures and junk. I’m realizing as I grow up that I held on to so many pointless things as a kid. The other day, I found ALL of my baby teeth. Not one was missing. Not only is that weird, it’s also gross. And it was in my desk drawer. Right. That makes sense, Ashley. How about instead of pens and pencils or markers and paper, you keep your baby teeth in there with all your spare buttons and some cassette tapes from when you used to tape your favorite songs off of Radio Disney. I’m growing up, and it’s because I keep opening my desk drawers and letting the light expose the strange and gross things that are there. He opens my drawers and shines light into darkness. He deep cleans and shows me part of what he’s doing, maybe not right away, but light reveals. It doesn’t conceal. I’m still on my first cup of coffee, so don’t expect brilliance this morning. I try to be a faithful Bible reader in the morning. For years, my dad’s Bible has sat on the edge of the china cabinet next to our kitchen table, only removed when he reads it at breakfast or takes it with him to church. My mom has a drawer for her Bible study supplies, all in the living room where she drinks her coffee in the morning and spends time with God. If I don’t have to get up too early, I read my Bible during breakfast like my dad…. I’m still working on that faithfulness piece. I rest in the knowledge that Jesus isn’t finished with me yet. Anyways, this morning, after a spotty record of faithful quiet time this week, I picked up my Bible and sat with French toast and coffee at our counter. I just finished reading Ephesians, and I was at a loss for where to go next. I like short books because I can finish them quickly and read them again in a week if I need to. Longer books intimidate me, so that’s why I was a little hesitant to get going on Isaiah. Gosh, it’s long. And it’s dense. And if there was ever a book where I’m not exactly sure what’s going on, it’s this one…. well, I sort of do, but there are a lot of things I don’t understand in it. It’s no Leviticus or Numbers or Revelation, but Isaiah knows Israel’s history and situation at the time he’s writing a lot better than I do. Still, I thought it might be a good book to read. I can take it slowly. Last week, my pastor reminded us that prayer is integral to everything in our lives. He encouraged us to pray before we read scripture, to ask God to speak and to give us clarity. So, as the caffeine went to work on my brain and lungs and heart and everything else, I asked God to speak and to give clarity… of course, this was in between getting distracted by my French toast and staring out the window at the blue truck rambling down the street. I need coffee to focus. I started at the beginning, and when I got to the end of chapter 1, something caught my eye. It was a small revelation, but I had to think about what changed the message from the beginning of Isaiah to the end. What made it so that Israel, the people to which both of these verses are directed, could become oaks of righteousness instead of oaks with fading leaves? But God is responsive. He sends Isaiah to prophesy to Israel, to tell them what they’re doing, that it’s destroying their relationship with Him, that it has consequences. As Israel turns to Him, God’s words change. He tells them that they will no longer be conquered by their enemies, that they will be called His people again, that they will become a healthy version of an oak. I need these reminders that God restores, that no cause is lost. My feet were in less than optimal shape when I left Europe, as you probably remember. I most likely have a stress fracture in my left foot, and my heels are so calloused from former blisters and chafing that they look much older than 20. Right. beautiful. I bet they are less than beautiful, especially if they have to climb mountains to bring the good news. My feet have been taking a much needed break this week, the only exception to that when I lost my mom in Target and traipsed the entire store trying to find her. I’m so not used to these huge stores. I wonder why Isaiah used beautiful. Or at least, I wondered until I looked at the entire chapter. The passage speaks of God loosening Jerusalem’s bonds, of putting on strength and being redeemed. Of course the feet of the person who proclaims that God reigns and that peace and salvation are coming would be beautiful. So the red, sore, blistered feet that have been crammed into hiking boots in order to scale a mountain are beautiful because they bring with them the message of salvation. I went to Holy Yoga with my mom yesterday. In the classes, when you’re in final relaxation pose (do not for a minute assume that we lay on the ground for the entire class though. Oh heck no. My soreness today is proof of that) the teacher comes around and usually rubs your temples with an essential oil and makes the sign of the cross on your forehead. This time, however, the teacher came around and rubbed our feet with oil. I can’t tell you how powerful that was to me. It was like an anointing, and in that moment, I felt God blessing my poor, hurting, calloused feet. Or rather, the message that I could bring on the mountains if I used my feet. The teacher came up to me after the class with a towel, saying, “Sorry, I used way too much oil on your feet!” I laughed and tried to wipe a bit of it off so I wouldn’t slide right out of my flip-flops. But I still could feel the oil on my feet all day. And it was a reminder of the blessing that blistered, calloused feet can bring. Our feet can be the instrument to bring good news, to proclaim salvation and redemption. I want my feet to be blistered and stress fractured if that means that I can use them to proclaim that God is redeeming and bringing new life. How beautiful that would be, to proclaim that our God reigns, no matter the toll on my feet. Because God will take care of my feet. I’ve been lightly complaining for the past three months that my hair is going wild. And it has been. I pondered trying to tell someone in German how to handle my wild, difficult, thick, curly hair, but I worried that I might end up with an afro. So I just let it go wild for the last three months. After three months of attempting to tame the beast, today I will visit my trusty Minnesotan stylist to get my hair cut. I thought about wandering to another stylist, Katie, but no one knows my hair like you do. In other news, I almost said “entshuldigung” to someone in the grocery store, but realized that they speak English and got so confused that I just stayed silent when Midwestern manners would dictate that I should say something. I just slid between the grocery carts, remembering” excuse me” a little too late. I’ve been enjoying my own bed and made it all the way through the night last night without waking up. So much for jet lag! I guess I was so sleep deprived that my body was ready to get into a rhythm. Note to all people returning from another time zone: the book my mom read was right! Just mess up your body clock a whole bunch the week before you come home, and you’ll have little to no jet lag! I’ve been slightly less successful in getting my floor clean. I know that I’m an out-of-sight-out-of-mind type person when it comes to my personal possessions, so I have to keep them spread out on my floor til I can decide where the absolute best place for it to be is. It will get worse before it gets better. I’m glad to be back with actual paper books as well. Over the past couple shelves, my book shelf has expanded a whole bunch and now extends all the way up the wall. Basically a dream come true. Next dream: being able to walk on my floor without accidentally stepping on souvenirs and clothes and stuff. On to a hair cut! It’s a bit day! Now that I’m back on US turf, I had to give the journey a new theme and take the parenthetical [In Austria] out of the title. It’s just a journey now. Doesn’t matter where I physically am. Well, it sort of does matter where I physically am though. Because my heart is so happy to be home. And I love my own bed, that doesn’t sag in the middle and has my pillows and sheets. And I love being back with my parents and in territory where people speak English consistently. Being in church this morning was pure joy. Oh Jesus, thank you for my church back. But my heart misses Graz and all the people I met there. The girls in the photo are just a couple of them. I’ve got new friends from all over now. I can think of all the cliches to talk about how I wish I could be in two places at once, to lead a double life, to bob my head like Jeannie and be back in Graz then come back here again in the blink of an eye. I’m lagging. My heart and head are still in Graz, I think. Or maybe they are starting to migrate home, but it will take them longer than my body. I also got a huge wave of exhaustion when it hit about 4:00pm today and my body thought it was 11:00pm. That’s another type of lagging. But the good thing about lagging is that it’s curable. Little more sleep, little bit of rest, little bit of contemplation about how I incorporate my two lives, little bit of coffee, lots of bits of Jesus, little haircut, and I think I’ll be good as new. New. Because I am new. Newer. New and improved, for the most part. Just lagging. I’m sitting in the Frankfurt airport right now, using my free half hour of wifi before we start boarding. I’ve gradually been hearing more and more English as I get closer to the United States (aka, heading to Canada right now, then to MSP). Now that I’ve left, I think I’m ready to be home. But oh. The goodbyes. I already hate saying goodbye. I never have the words to sum up what someone means to me or what I want them to know. But there was a bit of sweetness in the goodbyes this week, like the hint of sugar in my coffee on Friday since I was using the very last of my sugar. The friendships I’ve made here, though they’ve had little time to gestate and grow, have been so deep and wonderful. I said a lot of goodbyes, but I didn’t even get to say goodbye to everyone. I haven’t cried yet. I’ve been close just about all week though. I think the crying will come once all the travel adrenaline goes. I’m not sad to be going home, but I’m sad to leave. I’m sad for this adventure to be over. I’ll grieve whenever that wave hits. Where I often wished for more English, I’m grasping at the last bits of German, so proud of how much more I understand today than when I sat here on February 13th. I’m wearing the same shoes I was when I left (because I left so many pairs of shoes in a trash can in Graz since they were worn out), but my feet aren’t the same. They’ve got new callouses and blisters. And the rest of me is different, too. But I can’t say how. I’m not sure how I’ve changed or really, even all that I learned. But I suppose I’ll figure that out soon. Almost time to board. Signing off til I get to the US. It’s bar night here at my student apartment building. Usually this is the night where I sleep with headphones in my ears, not plugged into anything just trying to block out the noise, and I think dark thoughts to myself about how much I hate the noise and every single person making noise. I don’t really hate them. Disclaimer. I just hate that the floors are so thin that I can hear what’s going on in the basement from my ground floor apartment. That’s all. I’m sure they are fine and lovely people during the day time. I’m sure they don’t mean to keep me from sleep every single Wednesday night. They probably have no idea how much I can actually hear from here. Anyways, since I have only three days left to be here (actually, less than that, about two and a half), and I have to write an entire paper and take an exam in that time and pack and clean my room, I figured my time could be better spent than tossing and turning and sleeping badly. It’s after midnight, and I am not only awake, I’m trying to be productive. This does not happen. I’m a self-proclaimed ten-o-clock pumpkin because I firmly believe that nothing good happens after midnight and that very little happens that is good after ten. However, tonight is an exception to that. Tonight, I fight my sleepy eyes and read about Hemingway and plan my paper. I hope that these connections I’m making actually aren’t stupid when I look at them tomorrow. I eat a yogurt to keep my body nourished and keep drinking water. I ponder the packing and cleaning still to be done and remember how little brain power that takes. In a very short time, that’s probably all I’ll be good for… if I’m even good for that. I’m trying so hard to not process my experience yet. I just can’t. I’m not done here, and I’m already trying to think of how I’ll sum up my entire semester in another country to my friends when they ask how it was. I can’t. I’ll have to, but I can’t yet. Not while I’m still here. Instead, I’m trying to soak things up, to take pictures all over and again, and let myself experience the wonder of it all. No processing yet. Just experiencing for now.